After you launch it, the program will immediately check for updates and once complete, you'll experience their electronic program guide (EPG) with networks, programs, and other options. We found the EPG a little overwhelming at first glance because lines were drawn all over and sometimes showed up in the middle of program titles. As with most EPGs nowadays, you select the network or options on the left and the right columns adjust to your selection. We selected A-Z to pull up all available programs and selected CSI: Miami Season 5. 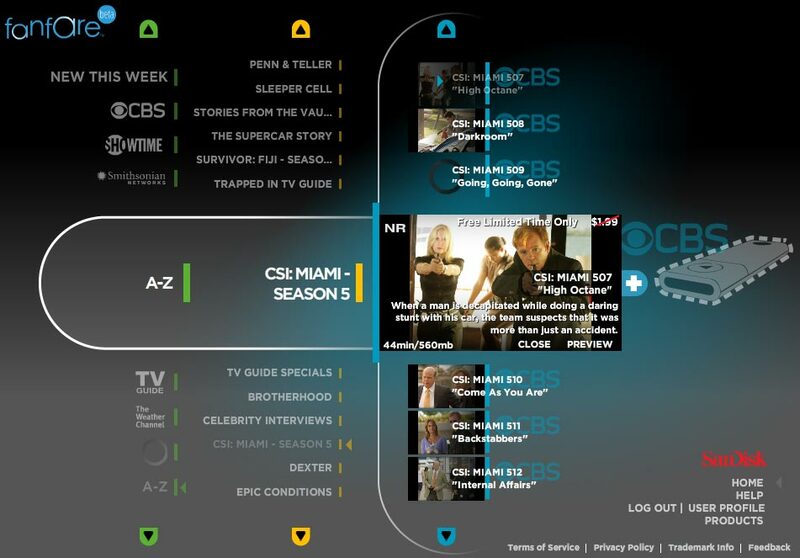 There are a number of shows available for free for a limited time and CSI is one of them. As you can see from the image below, there are a lot of text overlaying images and lines on the right hand side where it shows each episode. The program does provide the show title, price, rating, length, file size, and description for each show. We found the descriptions a bit hard to read because the text sat on top of the image without any gradient or background color to make it more readable. After browsing through the various shows, we decided to download one and check out the viewing experience. But...how do we download? After clicking several times on the actual image of the selected show, we noticed the plus-sign to the right of it. Once we clicked it, a message appeared that we must insert our TakeTV device in order to download the show. We were hoping we could view it on our PC first but it appears we’ll need to get our Sansa TakeTV prior to viewing. The Sansa TakeTV video player is a USB flash drive that will allow you to move content from the Fanfare system to your TV. Simply drag video files to the TakeTV player, and then slip the player into its TV cradle. The cradle plugs into the standard A/V sockets of nearly every existing TV. Next, you will be shown an on-screen guide where you can select the content stored on the Sansa TakeTV player, using the included remote control. The Sansa TakeTV video player will work with new and legacy TV systems via standard AV composite inputs or S-Video. With flash memory at its core, the device is small, durable and easily portable. Sansa TakeTV supports a variety of video formats, including DivX, XVID and MPEG-43. The Sansa TakeTV player is DivX Certified for Home Theater profile. The player connects to any PC via a USB connector, and works with Windows Vista, Windows XP and the latest versions of Mac and Linux. SanDisk's Sansa TakeTV flash memory-based player comes in a 4 gigabyte capacity, which holds approximately five hours of video, and 8GB, which can hold up to ten hours of video. It is available today for MSRPs of $99.99 and $149.99 respectively.